Our kind of oxymoron says Samia Qaiyum in a recent article where she writes about her impressions of an oasis of calm at Palais Amani. In a recent trip to Fez, Ms Qaiyum, fell upon and fell in love with Palais Amani, ‘the detailing throughout is nothing short of impeccable’ she says, ‘from hand-cut zellige tiles and hand-carved cedarwood to the gorgeous carpets and ornate lanterns that Morocco does best’. She certainly is smitten by our 18 bedroomed boutique hotel just inside the walls of the medina. But apart from the beauty of the restored palace, what struck Ms Qaiyum, was the quality of the food. ‘What you will notice, however, is the service excellence’ she says. 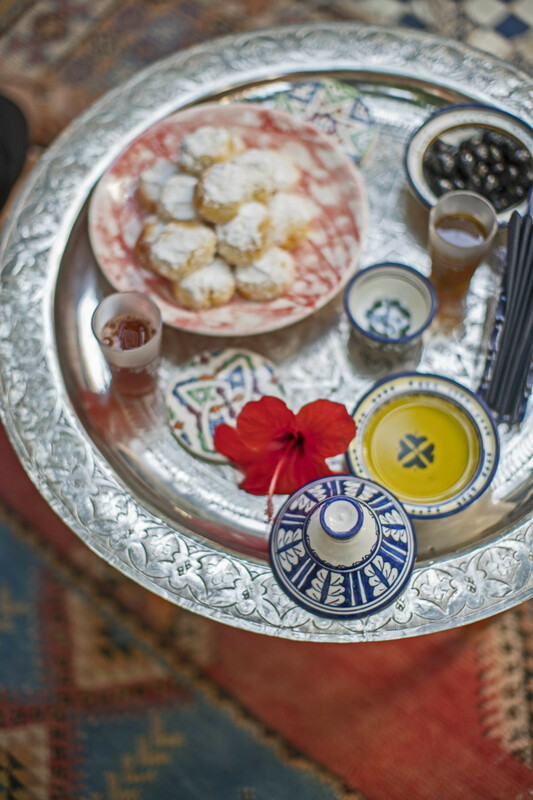 ‘A second helping of the coconut macaroons that welcomed you upon check-in’, that incidentally are one of the set recipes that you can perfect at the ‘renown’ Fez cooking school’ she enthuses. And if you decide to dine at the Palais Amani then Ms Qaiyum suggests to go for the ‘Market Moroccan’ concept instead. And that is the point, why hold back on the abundance of fresh, seasonal produce ‘that is practically on the property’s doorstep’. And she goes on to list some of the delicious dishes that our chef has dreamt up for this season’s market Moroccan. She finishes with the severe order to not leave the restaurant without having a desert : ‘Holding back on dessert at Eden is non-negotiable’ she says. But what was the icing on the cake for her was that you can learn how to make all these delicious dishes at the Fez Cooking School. You take a tour of the nearby food market with a chef who grew up in the medina which means that you will have access to the foodie spots that regular tourists won’t find. And you will have the occasion to interact with the locals whilst sourcing the ingredients for your class. What could be better ? A beautiful setting, delicious food, and the possibility to learn how to make it yourself. Ms Qaiyum certainly found her ultimate oasis of calm.